Danish mid-century modern design is well exemplified in the Raku Collection, serving as stylish addition to your bedroom decor. Two finishes are available: Two-toned black and gray and a warm walnut finish over the walnut veneer of the collection. 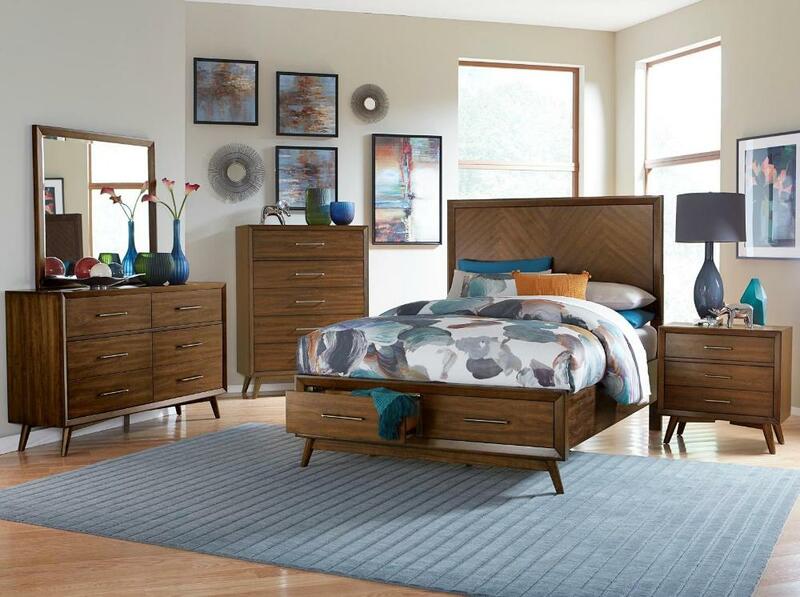 The bed features a wood panel headboard and storage footboard. Each case pieces features soft-close mechanisms for quiet and sure closure, elongated pewter-finished hardware and the classic look of tapered leg design. FEATURES: Black / Gray / Warm Walnut Finish ~ Mid-Century / Modern / Contemporary Style ~ Footboard Storage ~ Pewter Finish Knob Hardware ~ Tapered Legs ~ Dovetailed Drawers ~ Ball Bearing Side Glide.